BYOT: What Will They Bring? Our school is piloting a Bring Your Own Technology program this fall. I am very excited about this and have made a list of ideas for this fall. However, in my position, I am not sure what to expect in terms of my students and the devices they will have available to them. Despite this, I have created a survey for whatever class I may end up in. I plan to share this with my co-teachers and other staff members as I am also on the technology committee. This BYOT First Day Survey will help us get a better feel for what we can do in our classrooms with BYOT. Afterthought: Thinking about this today during professional development, I think I need to add a question texting/data packages. If they do not have unlimited texting or unlimited data, we would need to keep that in mind. I like this idea. I definitely see the benefit of students being able to bring and use their own technology in the classroom. I saw the other side of the issue when students were using one program at school and another at home. It always seemed to put the students using their own technology at home at a disadvantage when they came into the classroom. The apps question on the survey will be the key to ensuring controlled chaos. Excellent point about the incompatibility between home and school. I spent many frantic last minutes trying to convert/open/print my students work when we realized there was an issue. 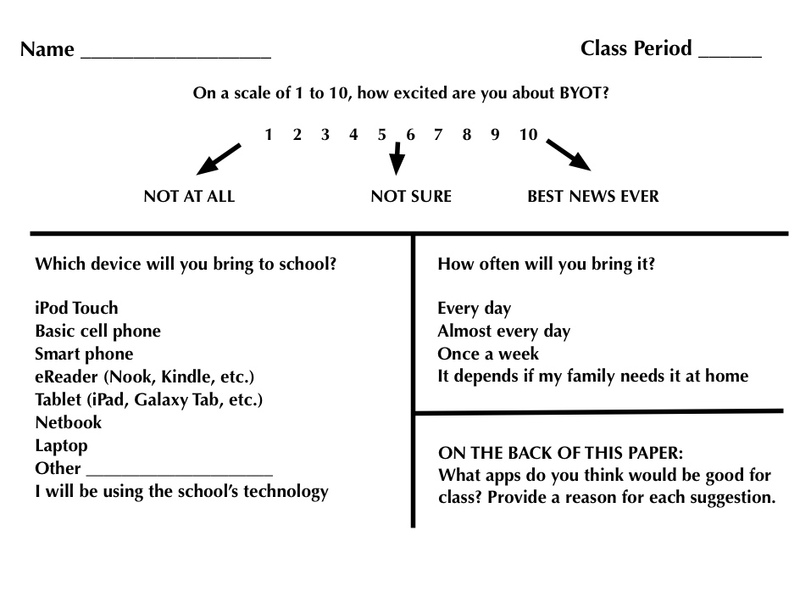 I never thought of how BYOT could eliminate that. Thank you Dan! What do they say?? Do what you love, love what you do. Love this survey!! My school district just gave the green light for personal technology as well. Some of us are nervous about how out-of-hand students might get with it. I think once everyone establishes procedures, things will be fine. Our tech dept. handled the major details/procedures/rules. How we handle it in our classrooms is up to each of us. As the inclusion teacher I just hope I get paired up with teachers who want to try. Don’t worry. I will keep you posted on how it goes!